1. John Drake of Exmouth, England, 1360; m. Christian, dau. 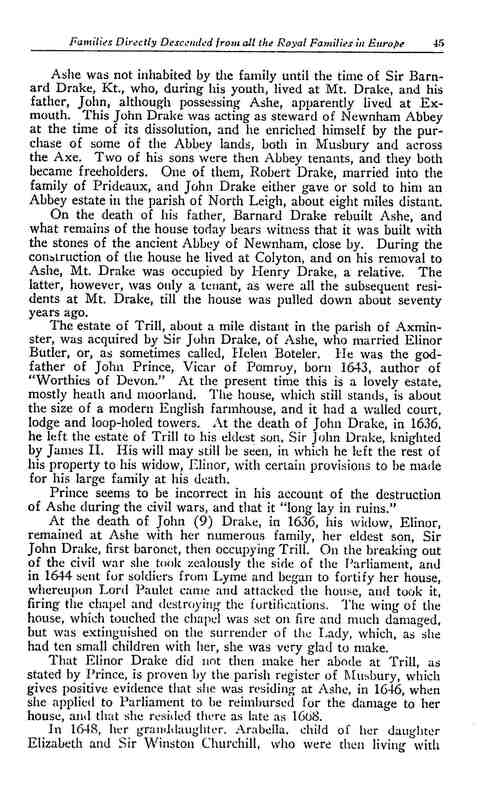 of John Billet; he acquired the estate of Ashe. His widow m. (2) Richard Francheney. 3. John Drake inherited Otterton; m. a Cruwys of Cruwys Morchand. 4. 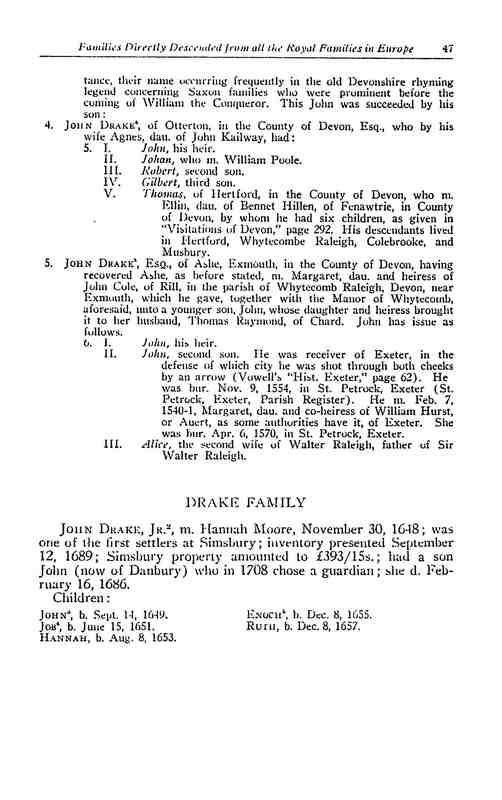 John Drake of Otterton m. Agnes dau. of Killoway. 5. John Drake settled first at Exmouth, and by a suit-at-law recovered Ashe. He m. Margaret, dau. of John Cole of Rill. 6. 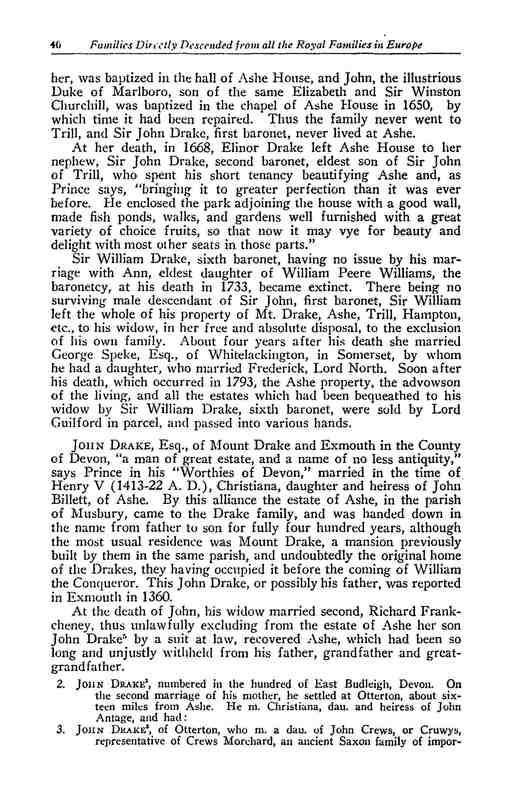 John Drake inherited Ashe; m. Anne, dau. 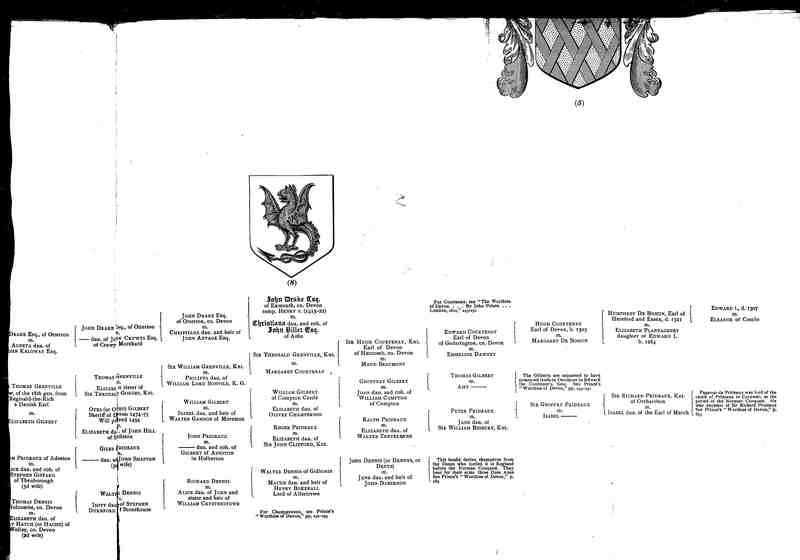 of Roger Greenville; his son Bernard inherited Ashe. 7. Robert Drake settled at Wiscomb, Parish of South Leigh, Devonshife. 8. William Drake of Wiscomb, County Devon. 1034. Jacob Drake 10 b. in England, came with his parents to New England in 1630; m. in Windsor, Apr. 12, 1649, Mary, dau. of John Bissell of Windsor. He d. Aug. 6, 1689. 1036. A daughter 10 into whose house the father was carried at the time of the accident that caused his death. 1646, Mary, dau. of Henry and Elizabeth (Saunders) Walcutt. He d. in Windsor, Sept. 6, 1692. 1038. Job Drake, 11 b. in Windsor, June 15, 1651; m. Mar. 20, 1672, Elizabeth Alvord 5 (1103), b. in Windsor, Sept. 21, 1651. 1039. Hannah Drake, 11 b. Aug. 6, 1653. 1040. Enoch Drake, 11 b. Dec. 8, 1655; m. Nov. 11, 1680, Sarah Porter. 1042. Simon Drake, 11 b. Oct. 28, 1659. 1043. Lydia Drake, 11 b. Jan. 10, 1661. 1044. Elizabeth Drake, 11 b. July 22, 1664. 1045. Mary Drake, 11 b. Jan. 29, 1666. 1046. Mindwell Drake,” b. Nov. 10, 1671. 1047. Joseph Drake, 11 b. June 26, 1674. RUTH Drake 11 (1041), b. in Windsor, Conn., Dec. 1, 1657; m. as (2) wife, Jan. 25, 1677, Samuel Barber’ (1005), b. in Windsor, Conn., bapt. Oct. 1, 1648; his will was proven April 4, 1709; hers proven Dec., 1731. Ruth Drake 11 m. Samuel Barber 2. Daniel Barber 4 m. Naomi Barber 4. Elizabeth Barber 5 m. Rev. Isaiah Butler, Jr. 5. Rebekah Butler 3 m. Moses Barber 3. Rebekah Barber 7 m. John White 10. John Barber White 11 m. Arabell Bowen 11 and Emma Siggins 5. Draco or Drago appears to have taken possession of an old Roman and British encampment in what is now the Manor of Musbury, Axminster, Devon county, England, which subsequently became known as Mount Drake. 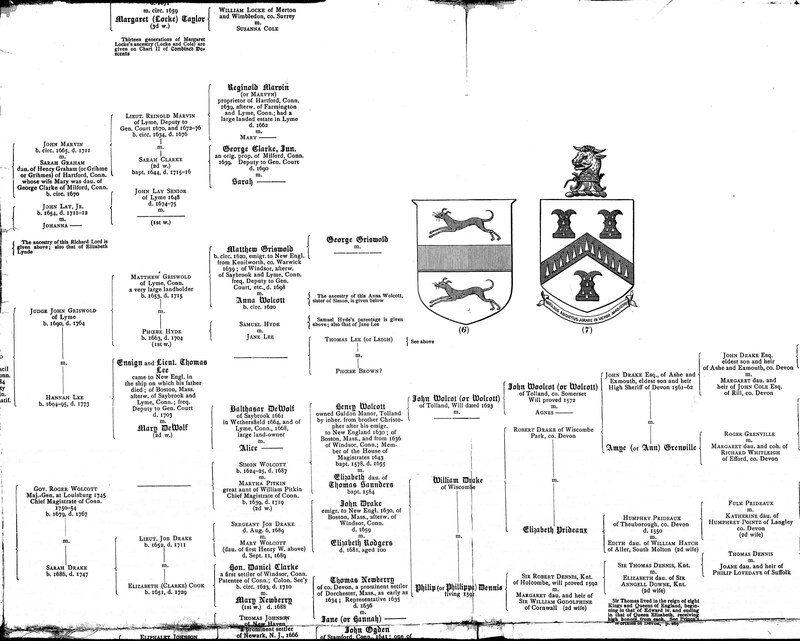 From this family it is probable that all of the name in England and Ireland are descended, as, although the crests of the various families of Drake in later days varied, their arms were the same, thus proving the common origin of the family. That the family is of great antiquity is shown from the fact that before the Norman conquest, 1066, A. D., it was well established in Devon county. In Domes Day Book six places are mentioned as possessed by persons of the name. We are told that “Honiton”, one of them, was well known to the Romans, and was held by Drago, the Saxon, before the conquest. The name Drago or Draco, the Latin for Drake, was in use among the Romans, and signifies “one who draws or leads,” a “leader.” The Romans obtained the name from the Greeks, among whom it is found as early as 600, B. G, when Draco, the celebrated Athenian legislator, drew up the code of laws for the government of the people, which bore his name. 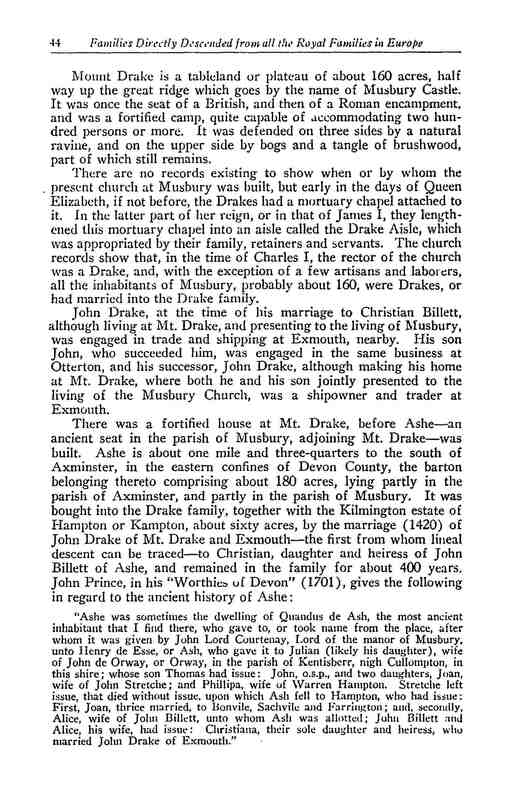 Ashe, an ancient seat adjoining Mount Drake, was brought into the Drake Family by the marriage, in 1420, of John Drake, of Mount Drake and Exmouth (the first from whom lineal descent can be traced), to Christiana, daughter and heiress of John Billett, of Ashe, and remained in the family about four hundred years. 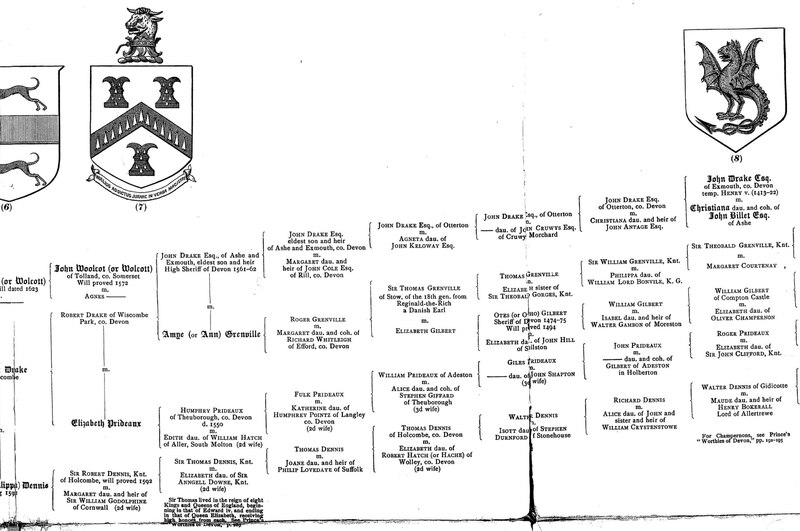 Of this family was Sir Francis Drake, the celebrated navigator; also Samuel Drake, D. D., of eminent literary attainments, who died in 1673, and whose equally eminent son of the same name edited Archibishop Parker’s works, etc. 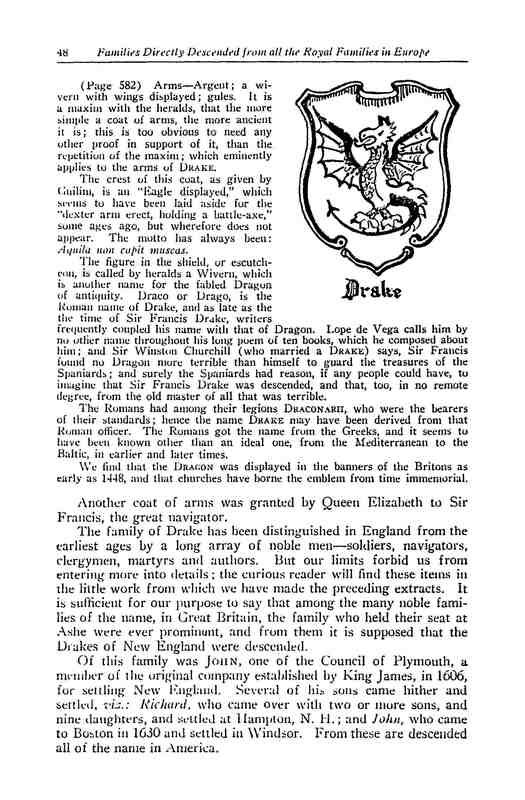 ; also Francis Drake, M. D., surgeon of York and F. R. S., a great antiquarian, author of “The History and Antiquities of York;” and Doctor James Drake, F. R. I., whose discoveries in anatomy are not surpassed in importance by those of Hervey, John Drake, of the council of Plymouth, one of the original company established by King James in 1606 for settling New England, was of a branch of the family of Ashe, several of whose sons came to this country, including John who came to Boston in 1630, with two or more sons, and who finally settled in Windsor; and Robert, also two or more sons and one daughter, who settled in Hampton, New Hampshire. From these brothers are descended all of the name in New England, and most if not all of those bearing it in the middle, southern and western states. We, however, meet with some modern emigrants of the name, but they are not numerous. Robert Drake was among the first who, to avoid persecution fled to New England, driven hither from fear of a revival of Popery in a later reign. He was contemporary with Admiral Sir Francis Drake, Knight, and was born the same year that he returned from his great voyage around the world, and was fifteen years of age when that commander died. (I) Robert Drake was born in the county of Devon, England, in 1580, the year of the great earthquake, came to New England with a family before 1643, and took up his residence at Exeter, New Hampshire, but removed from that place to Hampton, in the same state in the beginning of 1651. Here he owned and left a considerable estate. When he went to Exeter does not appear, but he may have been of the Rev. John Wheelwright’s company who settled there in 1638. 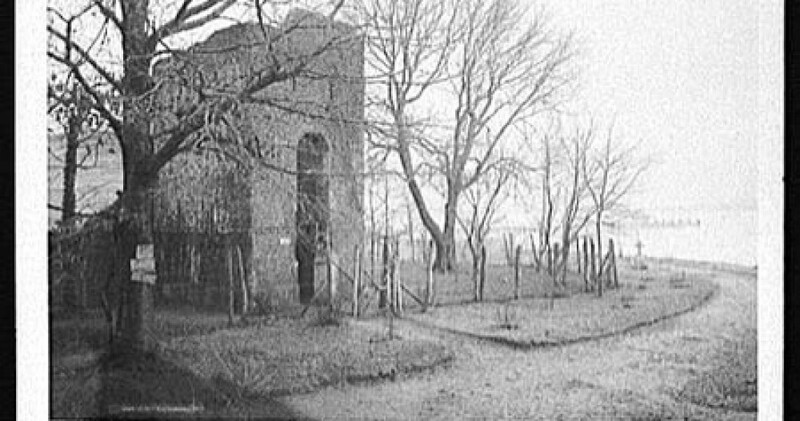 His house, which he bought of Francis Peabody, stood on the same place now occupied by the Baptist meeting house in Hampton. He was a man of eminent piety, was one of the selectmen in 1654, and was highly respected. He was sixty-three years of age when he came to America, and was eightyeight at the time of his death, January 14, 1668. His will, in which he describes himself as “searge maker,” was made in 1663. Two items in the inventory taken January 23, 1667, show the difference in values then and now. One hundred acres of land of a second division westward was valued at eight pounds ($40); four iron wedges and a pair of beetle rings, ten shillings ($2.50). There is no mention of his wife, and it is not known whether she came to America or not. He had three children, Nathaniel, Susannah and Abraham. 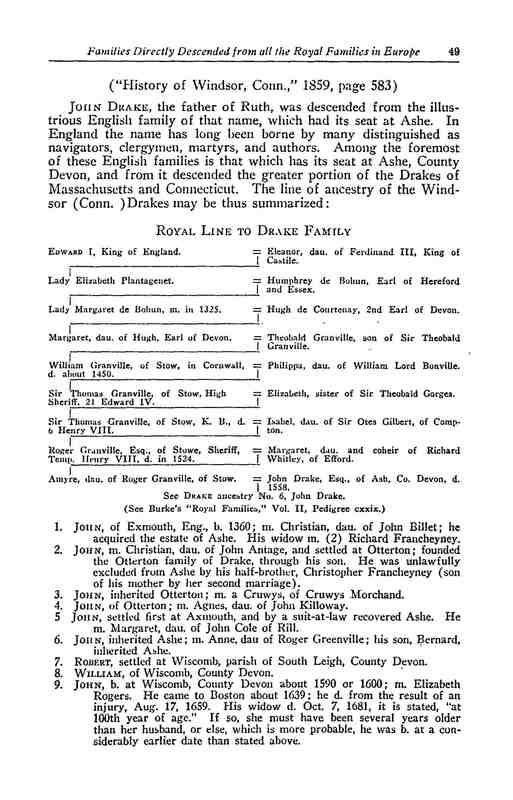 (II) Abraham, second son and third and youngest child of Robert Drake, probably came to New England with his father. He was a prominent inhabitant of Exeter in 1643, and afterward in Hampton, whither he went, probably with his father. 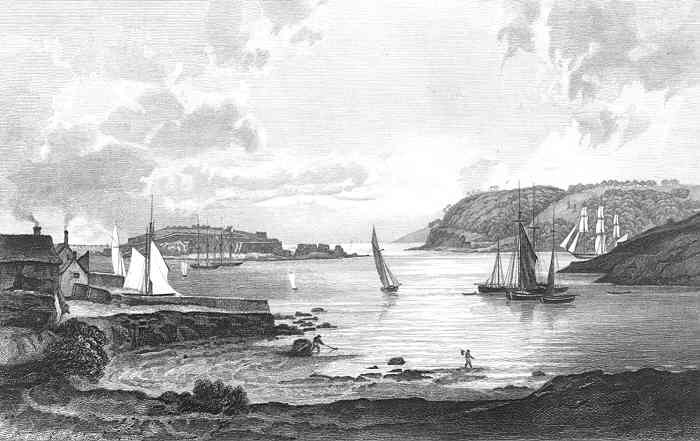 “His residence was at a place since called ‘Drake’s Side,’ because at was on the westerly side of a considerable swamp; and his estate has been handed down in the name to this day (1845), and in the name of Abraham, with a single exception, now over two hundred years,” says S. G. Drake, the historian of the family. How long before 1643 Abraham Drake was at Exeter has not been ascertained, but in a petition which with twenty others he signed and presented to the general court of Massachusetts, in’ that year, against the encroachments of the neighboring settlers, it is said, those people “know we long since purchased these lands, also quietly possessed them.” In the settlement of the Ox Common at Hampton in 1651 he had one share. In 1663 the town chose him to-lay out four thousand acres “west of Hampton bounds, and a way to Great Pond.” In 1665 he was appointed to lay out the second division, and in 1668 and 1669 he was chosen to run down the town lines. He was selectman in 1658, and perhaps other years, and in 1673 he had the appointment of Marshall of the county of Norfolk, in which office he probably continued until the separation of New Hampshire from Massachusetts, in 1679. He was a man capable of any business, a good penman, and forward in all public service. In a tax list of ad. 9 mo. 1653, of an amount of fifty-three pounds, two shillings, ten pence, his quota was ten shillings, two pence, the whole number of persons taxed being seventy-three. Abraham Drake, like his father, lived to a very advanced age, but the time of his death is not yet discovered. It appears from a pencil note in Mr. Toppans manuscript that he was living in 1712, at the age of eighty-four. His wife Jane died January 25, 1676. Abraham had by his wife Jane seven children: Susannah, Abraham, Sarah, Mary, Elizabeth, Hannah and Robert. (III) Abraham (2), second child and eldest son of Abraham (1) and Jane Drake, born December 29, 1654, died in 1714, aged fifty-nine years, appears to have been one of the wealthiest men of Hampton, the inventory of his estate being nine hundred and twenty-six pounds, five shillings. He was a prominent man in the town, as his father before him had been, and was selectman in 1696-1703-07-08. His wife was Sarah, and they had five children: Sarah, Abraham, Jane, Mary and Nathaniel. (The last named receives mention, with descendants,, in this article). 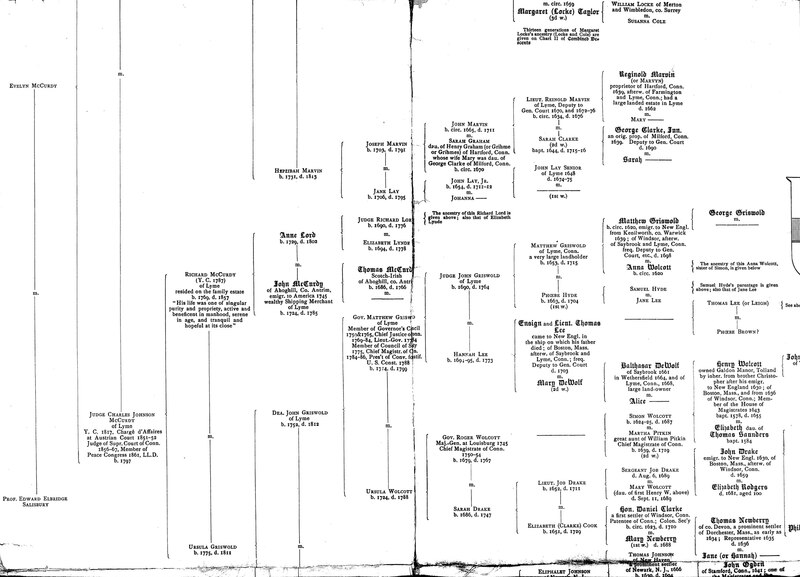 (V) Simon, fourth son and ninth child of Abraham and Theodate (Roby) Drake, was born October 4, 1730, in Hampton, and died November 30, 1819, in Epping, where he settled about 1752. That town was then a wilderness, the first framed house being built there only two years before. There was at this time much trouble from the Indians, and during the year that Mr. Drake settled there a party of savages had killed Mr. Beard and two women about two miles from his residence. He was a man of remarkable exactness, and the method and neatness of his farm was only equaled by his wife in all that pertained to her department. He was a fine farmer, and had a nice farm, which he left to his younger son. His wife, Judith (Perkins) Drake, was born April 18, 1736, and died November 30, 1819. Their children were: James, Mary, Abraham, Josiah, Simon, David, Theodate, Sarah, Samuel and Betsy. (VI) Major James, eldest child of Simon and Judith (Perkins) Drake,’ was born November 14, •755. m Epping, New Hampshire, and died in Pittsfield, February 26, 1834. He settled in the last named town when a very young man, being among its earliest settlers, and commenced clearing a farm from the wilderness. He was but nineteen years of age, upon the outbreak of the war of Independence, and abandoned his axe, shouldered a musket and joined a company then being organized for the Continental army. After sharing its fortunes in the ensuing struggle, he was discharged and returned to Pittsfield and resumed the work of clearing and improving his farm. He became major of a regiment of the state militia, and was always one of the town’s most prominent citizens. He was for many years a selectman, and long represented the town creditably in the state legislature. For integrity in all his dealings none could claim a higher place. “He was of middle stature, of fine figure, head round; and, in short, for a description of his person, that of Sir Francis Drake would be almost perfect •when applied to him.” This resemblance extended also to his mental and moral traits, for he was a man of great force of character, possessing a strong will and much determination, which qualities were tempered by sound judgment. His physical ability has seldom been equaled, and he was able to encounter the most extreme fatigue with but slight inconvenience. He became, eventually, the owner of several good farms, all of which he acquired by his great industry and economy. He was married December 17, 1781, to Hannah Ward, daughter of Lieutenant Cotton and Hannah (Mead) Ward, of Hampton. She was born October 31, 1763, and died December 17, 1848. They had twelve children, each of whom lived to be over sixty years of age. Their combined ages made a total of more than eight hundred and seventy years, the average age being seventy-two years, six months and sixteen days. Their names were as follows: Cotton Ward, Sarah, Mary, Hannah, Judith, Rachel, Theodate, Simon, Deborah, Betsy, James and Noah Ward. (VII) Colonel James, third son and eleventh child of Major James and Hannah (Ward) Drake, was born June 29, 1805, in Pittsfield, and died in that town, April 7, 1870. He was born on the Drake homestead, near the Quaker meeting house, and was brought up to agriculture, which he followed successfully for some years. He also dealt extensively in live stock. He moved to the village of Pittsfield and became president of the Pittsfield Bank, afterwards the National Bank, and held that position for the remainder of his life. He was an excellent business man and acquired a handsome property. He figured prominently in public affairs, serving as selectman of the town and was a member of the state senate in 1847-48. In political struggles he supported the Democratic party. He early showed a fondness for military life, and rose from private to that of colonel in the militia. He commanded the eighteenth regiment with signal ability and credit until the abandonment of the militia system. He had a good figure and authoritative voice, and made a soldierly appearance, whether on foot or in the saddle. His strict adherence to principle was conspicuous among his commendable qualities, and the cause of morality and religion had in him a staunch and generous supporter. His death occurred at his home in Pittsfield Village. He was married, August 13, 1834, to Betsy Seavey, who was born October 14, 1811, a daughter of George and Betsy (Lane) Seavey, of Chichester, New Hampshire. (See Seavey). She was an attractive and charming woman, well educated, having finished her training at Hampton Academy: she was possessed of an evenly balanced mind with rare executive ability and self control, was always mindful of the happiness and comfort of others, was a church member, and hers was a life of rare christian devotion. She died September 28, 1865, and was survived by her husband for more than four years. They were the parents of three children: Georgianna Butters, Frank James and Nathaniel Seavey. (VIII) Georgianna Butters, eldest child of James and Betsy (Seavey) Drake, was born January 15, 1836, at the old Drake homestead in Pittsfield, and is a woman of fine mental capacity and attainments, endowed with the graces and virtues essential to true womanhood, and is at home alike in the social and the domestic circle. She was married September 1, 1858, to Josiah Carpenter, now president of the Second National Bank in Manchester. Her musical ability early found opportunity in social functions and church work. In Manchester she is prominent in charitable and patriotic work, being president of the Manchester Children’s Home and vice-president of the Woman’s Aid and Relief Society, two of the oldest and leading charitable institutions of the city, and is also connected with many other charities. She is one of the charter members of the National Society of Colonial Dames in the State of New Hampshire, and for six years held the office of state regent in the National Society of Daughters of the American Revolution, from 1895 to 1901. She then declined a re-election, and was made honorary state regent for life. He regency covered a period of unusual prosperity in the society in New Hampshire, the chapters increasing from two to sixteen in number under her judicious and zealous guidance. For many years she has been a member of the Episcopal Church, and actively connected with the various branches of its work at home and throughout the diocese. With her husband she has devoted much time to travel, and seldom spends winter in the severe climate of New Hampshire. They have traversed nearly every section of our own country, and the countries of Europe and the Holy Land, Asia and Africa having contributed memories of various experiences and valuable information. Two children have been born to Mr. and Mrs. Carpenter: Georgia Ella, and a son who died in infancy. The daughter was born October 13, 1859, and grew up under most careful training and developed to womanhood, rich in intelligence and accomplishments, with a cheerfulness and kindliness of temper which endeared her to all. She was married, March 27, 1889, to Frank M. Gerrish, and they went abroad for a wedding tour. As in former ocean trips Mrs. Gerrish suffered severely from sea sickness, from the effects of which she died, August 29, 1889, nine weeks after her return to the beautiful home which her parents had erected and presented as a wedding gift. (VIII) Frank James, son of James and Betsy (Seavey) Drake, was born November 3, 1842, on the Drake farm in South Pittstield. He pursued his studies at Pittsfield Academy and under tutors, and graduated from Dartmouth in 1865. He engaged in business in Manchester, New Hampshire, and died suddenly of appendicitis at his summer home in Barnstead, August 20, 1891′. He was married June 7, 1869, to Harriet C. E. Parker, daughter of Hon. James V. Parker. They were the parents of two children: James Drake and Helen. The former died in infancy, and the latter is now the wife of Charles Spalding Aldrich, of Troy, New York. (VIII) Nathaniel Seavey, youngest child of James and Betsey (Seavey) Drake, was born September 16, 1851, in the house which he now occupies on Main street, Pittsfield. His education was gained in the public schools and completed at Pittsfield Academy. Having turned his attention to a business career, he engaged for two years in the clothing business, and afterwards was connected with the United States and Canada Express Company, and the American Express Company in Pittsfield, and subsequently spent some time in their offices in Concord, New Hampshire, and Boston, Massachusetts. Later he entered the employ of the C. B. Lancaster Shoe Company and had charge of its office, remaining with this concern about twelve years, until it removed to Keene, New Hampshire. During the last six years of this time he was superintendent of the factory and its branches, and the capacity of the plant was much enlarged. The business was the largest ever carried on in Pittsfield, involving a weekly pay-roll of about four thousand dollars. Mr. Drake was one of the founders of the Hill & Drake Shoe Company, afterwards known as the Drake & Sanborn Shoe Company. In this connection it is interesting to note that although Pittsfield has the reputation of being a manufacturing town, this shoe company, which employs some over fifty people, was the first enterprise giving employment to over a dozen men that was- conducted on home capital. All the other manufacturing enterprises of the town have been and are still owned by outside capital. In politics Mr. Drake is a Democrat, he has served with ability as moderator and treasurer many years. He is a director of the Pittsfield National Bank, and one of the trustees of the Farmers’ Savings Bank. Since the organization of the Pittsfield Aqueduct Company, in 1884, and the Pittsfield Gas Company, in 1888, he has served continuously as clerk of these corporations, and is a director in the latter company. He is a director of the Pittsfield Board of Trade, an officer in Catamount Grange, and a member of the Pittsfield Library Association, and is ever most active in promoting the welfare and highest interests of his native town. At the present time he deals quite extensively in real estate. His prominence in business circles, together with his high social standing, places him in the front rank among the leading citizens of Pittsfield. Mr. Drake was married, March 17, 1873, ‘to Mary A. R. Green, who was born July 3, 1857, daughter of Daniel and Elizabeth (Chase) Green, of Pittsfield. She is a lady of pleasing manners and true womanly grace, sharing her husband’s popularity. They have two children: James Frank, born September I, 1880, and Agnes, April 2, 1883. The daughter and both parents are members of the Episcopal Church. After graduating as salutatorian of her class from high school in her native village, Agnes attended Lasell Seminary at Auburndale, Massachusetts, and received a diploma from there in 1903. She was a member of the glee club of the Delta Society, and was identified with Prize Company A, in the military drill, which is one of the prominent features of this seminary. Since returning to her home she has interested herself in the furtherance of whatever tends to the betterment of her native village, especially in its schools, and is a zealous member of the board of education. (IX) James Frank, only son and elder child of Nathaniel S. and Mary A. R. (Green) Drake, was born September I, 1880, in Pittsfield village, New Hampshire. His early education was received in the graded schools of his native town, after which he entered Kimball Union Academy at Meriden, New Hampshire, from which he received a diploma in 1808. In the fall of that year he entered Dartmouth College and graduated therefrom with the degree of Bachelor of Arts in 1902. He then took a year of post-graduate study at Dartmouth in the Amos Tuck School of Administration and Finance, receiving in 1903 the degree of Master of Commercial Science. After completing his post-graduate work he went to Springfield, Massachusetts, to accept the position of secretary of the Springfield board of trade, which he still holds having received at the end of each year, in the shape of increase in salary, substantial recognition of the services he has rendered. While in college he became a member of the Theta Delta Chi Fraternity. Both as an undergraduate and as an alumnus he has taken an active part in all matters pertaining to its welfare, serving as the representative of the Dartmouth Charge at three national conventions of the fraternity. From the time of his graduation he has been actively interested in the prosperity of his college, and through his efforts a considerable number of young men have chosen that institution as their Alma Mater. He is chairman of the executive committee of the class of 1902 of Dartmouth, in whose hands is the control of all matters pertaining to the class. For the past three years he has served as secretary of the Dartmouth Alumni Association of Western Massachusetts. He has been chosen by Dartmouth College as one of a committee of nine from the body of alumni to take charge of the work of raising a larger scholarship fund for the college. He was the representative of Dartmouth College at the meeting of college men held in Springfield. 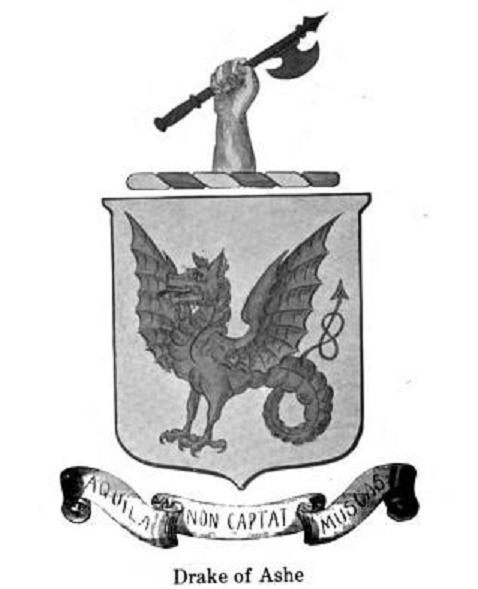 May 17, 1906, to form a federation of college and university clubs, and was chosen as one of the organization committee, which reported the result of its work at another meeting held in Springfield, December 13, 1906, when a permanent organization known as the Federation of College and University Clubs in the United States, was formed. He was chosen treasurer of the Federation and a member of its executive council. Soon after his arrival in Springfield he became connected with The Home Correspondence School of that city, serving as the head of the commercial department of that institution, which position he still occupies. In December, 1904, in company with an old school and college friend, he purchased The Home Correspondence School and has since served as secretary and treasurer of that corporation, the friend above referred to being the active manager, and Mr. Drake caring for the financial end of the business. Under their administration the school has prospered remarkably and to-day ranks as one of the very best institutions of its kind in the country. In addition to the business enterprise mentioned, Mr. Drake has found time to interest himself in some others which have brought him favorably before the public. In 1905 and again in 1906 he succeeded in securing for Springfield the annual championship football game between Dartmouth College and Brown University, taking upon himself the entire management of these contests—no small undertaking—and carried them through in a highly successful and creditable manner. His position as secretary of the Springfield board of trade has caused him to become connected with several other enterprises of a public nature. In May, 1903, soon after coming to Springfield, he became secretary of the Connecticut River Navigation Association, an organization which has for its object the opening of the Connecticut river to navigation from Hartford, Connecticut, to Holyoke, Massachusetts. In 1905 he was chosen secretary of the McKinley Memorial Commission, a commission chosen by the citizens of Springfield to take charge’ of a considerable fund raised by popular subscription for the purpose of erecting a memorial to the late President McKinley. He also identified himself with the Independence Day Association of Springfield, an organization that has charge of the observance of Indepcndance Day in that city, and has taken an active part in the association’s work. For three years he has been a member of the educational committtee of the Young Men’s Christian Association of Springfield, which committee has under its supervision a school of over a hundred students with a competent force of instructors. He is a member of the Economic and the Diversity Club, the latter being one of Springfield’s prominent literary organizations. In June, 1903, he became a member of the Country Club of Springfield and is now serving as one of its executive committee and for the third year as its secretary. He is a member of the club’s tennis team and an enthusiastic golfer. In the fall of 1003 he was chosen a vice-president of the Massachusetts State Board of Trade and a member of its executive council, positions which he still holds. In politics he is a firm believer in the principles of the Democratic party as were his father and paternal grandfather before him. While still a small boy he displayed an unusual interest in matters political, and that interest he has always maintained. Towle, and (second), Edgerly, of Epping who died on the 15th and was buried on the 17th of June, 1775, the day of the battle of Bunker Hill. The children, all of the second marriage, and born at Epping, were seven: Abigail, Josiah, Eliphalct, Abraham, Daniel, Nancy and Sally. (VI) Eliphalet, third child and second son of Thomas and (Edgerly) Drake, was born September 18, 1765, and died July 9, 1839. He was a farmer and spent his life in Chichester. He married, in 1788, Judith Staniels, of Chichester, who was born February 18, 1769, and who died May 24, l36i. (VII) Thomas, son of Eliphalet and Judith (Staniels) Drake, born in Chichester, February 14, 1796, died April 29, 1842, aged forty-two years, waa successful farmer and stock raiser. He married in Loudon, December 29, 1824. Anna Winslow, who was born April 2, 1801, who died in 1872, and who was a daughter of Bartholomew and Hannah Winslow. Mr. Winslow died February 25, 1838, aged eighty years. Mrs. Winslow died November 4, 1857, aged ninety years. 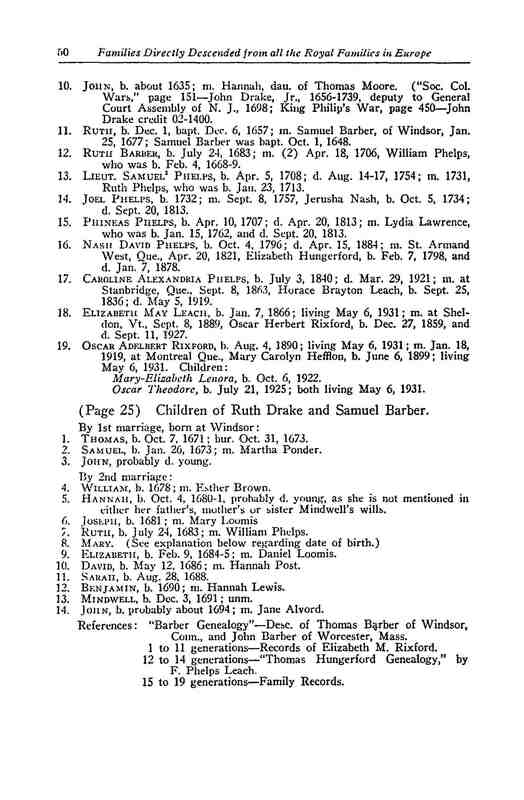 The children of Thomas and Anna (Winslow) Drake were: Jacob P., who died young, and James H, twins; Jacob E., Hannah Ann, Charles H., Colcord W. and James Henry (formerly Henry F.) and Sarah Ann (twins). (VIII) James Henry, seventh child and fifth son of Thomas and Anna (Winslow) Drake, was born in Chichester, December 27, 1841. When he was about three years old his mother moved with her family to Concord, where she remained about seven years, and then moved to Manchester. James H. was educated in the public schools of Concord, Manchester and Loudon, and in New London and Newport academies. In 1861 he entered the employ of the Concord railroad as baggage-man in the Concord depot, and soon after became a brakenian. Subsequently he took a place with the Northern New Hampshire railroad as brakeman, and later as mail agent and expressman. He was promoted to conductor in 1866, and served in that capacity until 1899, when he retired from railroad employment, having been in service thirty-eight years, thirtythree years of which time he had been a conductor of a passenger train, running most of the time between Concord, New Hampshire, and White River Junction, Vermont. Soon after leaving the railroad service Mr. Drake went into business under the firm name of George L Lincoln & Company, of Concord, dealers in furniture, from which he withdrew two years later, and entered into partnership with Fred. Marden. under the name of Marden & Drake, shoe dealers, in which line he is now actively and successfully engaged. He is Independent in politics, and is not a member of any club or secret society. James H. Drake married, in 1887, Ellen F. Holt, born in 1843, a daughter of William K. Holt, of Loudon. They have two children: Helen, now a student at Vassar College: and Benjamin, a student in the Concord high school. (IV) Captain Nathaniel, youngest child of Abraham (2) and Sarah (Hobbs) Drake, was born May 7, 1695, at “Drake Side,” in Hampton, and lived through life in his native town. He was married (first) June I, 1716, to Jane Lunt, who died December 2, 1743, at the age of fifty-one years. He was married (second), November 22. 1744, to Abigail Foss, a widow, of Rye. His children, all born of the first marriage, were: Robert, Nathaniel, Jane, Abraham, and Sarah and Mary (twins). (V) Abraham (3), third son and fourth child of Nathaniel and Jane (Lunt) Drake, was born March 1, 1726, in Hampton, and settled in what is now Brentwood. He was married, March 5, 1752, to Martha Eaton of Salisbury, Massachusetts. (VI) Abraham (4), son of Abraham (3) and Martha (Eaton) Drake, was born June 7, 1758, in Brentwood, New Hampshire, and died in New Hampton. He was married, January 27, 1782, in New Hampton, to Anna Burnham, who was born July 26, I7S6, in Lee, New Hampshire, daughter of Joshua Burnham, and died February I, 1805. They resided in New Hampton, where all their children were born, namely: Polly (died young), Abraham, Polly (died youngj, Joshua B., Joseph, Nancy, Betsey S., Jeremiah M., Thomas, Polly and Simeon D.
(VII) Joseph Burnham, third son and fifth child of Abraham (4) and Anna (Burnham) Drake, was born December 13, 1789, in New Hampton, and married Polly (or Mary) Thompson. They resided in New Hampton, where they had the following children: Louisa, Nancy, John A., Betsey Dow, Joseph Thompson, Francis M. and Abraham. (VIII) Betsey Dow, third daughter and fourth child of Joseph B. and Polly (Thompson) Drake, was born November 4, 1822, in New Hampton, and became the wife of Hiram Clark. (See Clark, IV). George Allen Drake, business man of DRAKE Dover, New Hampshire, is perhaps one of the best examples of the purely selfmade man that can be found in Strafford county, where he has lived something less than fifteen years. He is a native of Illinois and was born at Chatsworth in that state, April 10, 1868. His father, Charles W. Drake, died when George was seven years old, and within the next year he was left an orphan by the death of his mother. During the next five years he lived with the family of his brother and went to school when it was possible for him to do so, but in that respect his opportunities for obtaining more than an elementary education were very limited, at the age of thirteen years he started out to make his own way in life, turning his hand to whatever he could find to do and often doing the work of a boy much older and stronger than himself. At the age of eighteen he secured employment on the Union Pacific railroad, where he worked about two years, then went out to work on a ranch, and also for a time was in the service of the T. & S. railroad. In 1894 Mr. Drake came east and located in Dover, New Hampshire, having saved the money he had earned in railroading and ranching in the west, and with that as a capital he was able to start a general livery business in the city. This he continued successfully about ten years, and in July, 1905, purchased the steam carpet cleaning works formerly carried on by Daniel Page, and is still its proprietor. 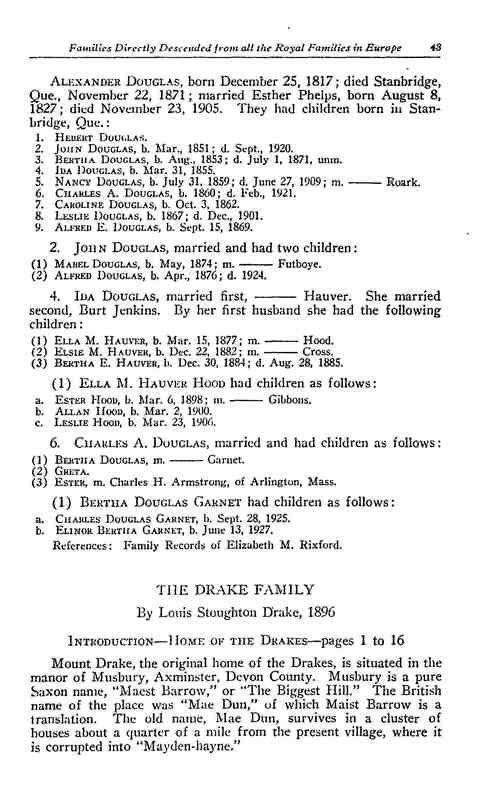 Mr. Drake married, Carrie E., daughter of Timothy Hussey, and has one son, Charles W. Drake, born in Dover, December 18, 1899. The manor of Nutwell was given, at an early period, by the Dinham family (fn. 29) (it having been parcel of their barony of Hartland (fn. 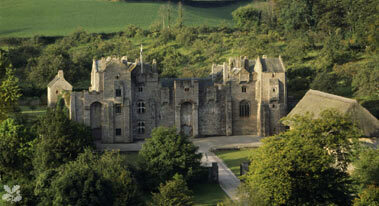 30) ,) to the priory of Dinham, in Brittany. After the suppression of alien priories, the Dinhams became again possessed of this manor; and Sir John Dinham, who was treasurer to King Henry VII., and afterwards Lord Dinham, built here a castellated mansion, for his own residence, which Risdon calls a fair and stately dwelling. Sergeant Prideaux purchased this estate of the heirs of Dinham. In Sir William Pole’s time, it was the seat of Sir Thomas Prideaux; afterwards, successively, of Sir Henry Ford, and the Pollexfens. Of late years, it was the property and seat of Sir Francis Drake, Bart., who made great alterations in the house and grounds; the chapel was converted into a handsome library. From Sir Francis Drake, it passed by devise to his nephew, the late Lord Heathfield; and on his death, in 1813, to his sister’s son, Thomas Trayton Fuller Elliot Drake, Esq., lately created a baronet, whose property and residence it now is. Nutwell House was garrisoned for the parliament, during the civil wars. YARCOMBE, or YARTCOMBE, in the hundred of Axminster and in the deanery of Dunkeswell, lies on the borders of Dorsetshire and Somersetshire, about seven miles from Honiton, and four from Chard in Somersetshire. The river Yarty, in a course of about four miles, divides Yarcombe from the above-mentioned counties. Marsh, on the new road of communication from London to Exeter, through Ilminster and Chard, is in this parish. William the Conqueror gave the manor of Yarcombe to the abbot and convent of St. Michael in Normandy, who allotted it to their priory of Otterton, in this county. After the dissolution the manor, or a moiety of it, was granted to Robert Earl of Leicester, who sold it to Robert Drake, Esq., of the Ash family, by whom it was conveyed to the celebrated Sir Francis Drake, the circumnavigator, who was possessed of the other moiety by grant from the crown. It descended (with the impropriation) to the late Lord Heathfield, and is now the property of his nephew, Sir Thomas Trayton Fuller Elliot Drake, Bart., who is improving the estate, and making extensive plantations. (fn.31) Footnotes: 29 Oliver de Dinham possessed it in the reign of Henry II. Madox’s Hist. of Exchequer, p. 409. 30 Hundred Roll. 31 Sprigge’s England’s Recovery, p. 159, 160. 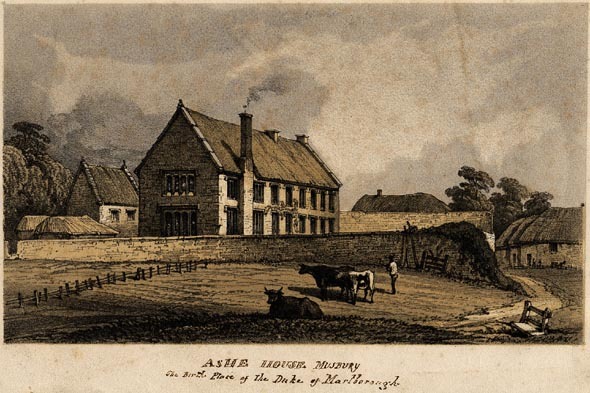 Shevehayne, now esteemed the manor-house, was anciently in the family of Speke, and passed, by successive sales, to Woode, Stawell, and Martyn. In this house, which is occupied occasionally by Sir T. T. F. E. Drake, is a fine portrait of Sir Francis Drake. Paynshay, formerly parcel of the manor, was, in 1260, given by the prior of Otterton to William Pyne, or Payne. It passed, by descent, to Sturton and Daubeny, by successive sales, to Smyth, Woode, and Bret. It is now the property of Sir T. T. F. E. Drake, who purchased it with the great tithes, about 1808, of Mr. Codrington, now Sir Bethel Codrington, Bart. The King is patron of the vicarage, which, before the year 1247, was endowed with a glebe of 30 acres, and certain gardens and houses. Source: Chartulary of Otterton Priory, in Chapple’s Collections. 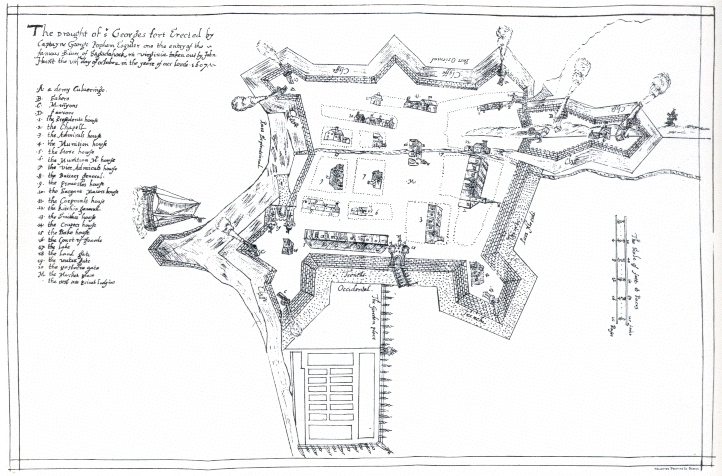 A map of Fort St. George, drawn by colonist John Hunt in 1607/08 but not discovered for more than 250 years. Public Domain image. “The Founding of America” is boggy ground to cover, since 19th-century Americans mythologized the New England colonies to the exclusion of other people who were at the roots of their country too. The 20th century has seen Jamestown and the Virginia Colony surge forward to equal footing, but there are others still searching for recognition. The city of St. Augustine, Florida has been making noise recently—mostly tourism-related publicity stunts—but there’s no denying that it’s the oldest continuously inhabited settlement in the continental US. But even St. Augustine’s claim to fame is heavily laden with weasel words, mostly to avoid having to deal with San Juan, Puerto Rico. It’s also carefully designed to exclude a couple of other places, not to mention one entire region. So, OK: founded in 1541, St. John’s, Newfoundland is the oldest city anywhere north of the Rio Grande, as well as the oldest English settlement in the New World—Newfoundland just had the bad grace to not be part of the Thirteen Colonies and so it’s forgotten by the large majority of people who don’t even realize there were sixteen British American colonies in 1776 (besides Newfoundland there was also Nova Scotia, St. John’s Island AKA Prince Edward Island, and that’s not counting the peculiar case of Québec). Even if you want to avoid offshore islands, Annapolis Royal in Nova Scotia is also three years older than Jamestown. Some historians even think that the Portuguese got to Newfoundland before John Cabot in 1497—ever notice that the names of several of Newfoundland’s geographical features are bastardized Portuguese? Cape Spear is Cabo da Esperança, Cape Race is Cabo Raso. Conception Bay is Baia de Conceicao, and tiny Baccalieu Island in Conception Bay is Ilha do Bacalhau, which is especially interesting since that name was first used by João Vaz Corte-Real in 1474 after a nebulous mission of his that (if you look at it the right way) might have been to Newfoundland. The Portuguese connection to North America only faded when two of Corte-Real’s three sons disappeared after exploring what was definitely the Newfoundland area, the Portuguese looked at their choices—Newfoundland? Or Brazil?—and made the obvious decision. And then there’s the whole 11th-century Viking thing in the Great Northern Peninsula…one can see why the afore-mentioned 19th century Americans washed their hands of the whole mess, cried “Pilgrim forefathers!”, then sat down for turkey and corn at Thanksgiving. Still, all fame aside, the Mayflower expedition was not even the first English settlement in New England. The Plymouth Colony wasn’t founded until 1620. Jamestown was founded in 1607 by the Virginia Company of London, while a second, complementary effort the same year was made by the Virginia Company of Plymouth and targeted the mouth of the Kennebec River in Maine. This was the Popham Colony, sometimes called the Sagadahoc Colony. As the names of the two companies suggest, at the time “Virginia” applied to a much larger area than it does in the present day. This is almost entirely due to the success of the southern effort and the failure of the northern, which opened up the north to further charters. The initial plan was somewhat different: King James I deliberately created two overlapping grants, to inspire competition between two rival Virginia Companies. 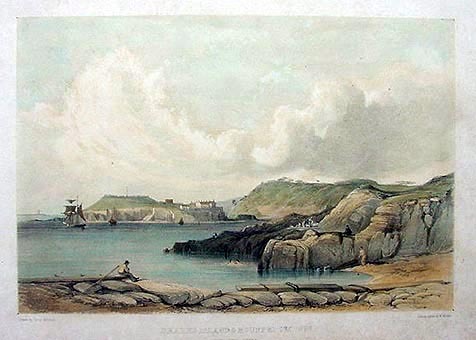 “Of London” received the coast from 34° to 38° north, “Of Plymouth” received 41° to 45° north, and the land in-between would go to whichever group was strong enough to get to it first. The Dutch, not incidentally, used the ambiguity of this no-man’s-land to found their own trading settlement at 40° 42´—which is to say, the southern tip of Manhattan Island in modern-day New York City. That neither Virginia Company managed to claim the middle area says volumes. Jamestown’s Virginia was a relative success, but it’s rightly notorious for being a typhoid- and dysentery-ridden deathtrap in its early years. It almost certainly would have been abandoned if not for the immense profits from tobacco, which was only introduced five years after the first settlement and largely by luck at that. Popham Colony, by contrast, had less of a problem with mass death and more with money. 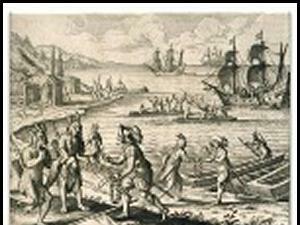 The effort to colonize Maine started in 1605 when Sir Ferdinando Gorges sponsored on a voyage to explore the area. On his return, Weymouth gave his destination a passing grade (and, incidentally, brought the Patuxet Indian Tisquantum to England where he wGeorge Weymouthould learn English, be returned to New England, be kidnapped into slavery by another Englishman, serve John Smith for a while, return to his village to discover everyone in his sub-tribe dead from virgin-field epidemics, and famously help to feed the Plymouth Colony during their first winter). On the strength of Weymouth’s recommendation, Gorges became one of the main shareholders in the Virginia Company of Plymouth. The other important shareholder was Sir John Popham, the Lord Chief Justice of England. While Gorges sent a second exploring ship in 1606 with instructions to look for a colony site, Popham’s son George was selected to lead the colony. The next year he and two ships—Gift of God and the Mary and John—left for Maine with 120 settlers and their equipment. Unfortunately for them, they set out late in the year and didn’t land until August 18th, 1607. Even in late summer coastal Maine’s temperature drops below ten Celsius some nights; by October it’s regularly pushing freezing. 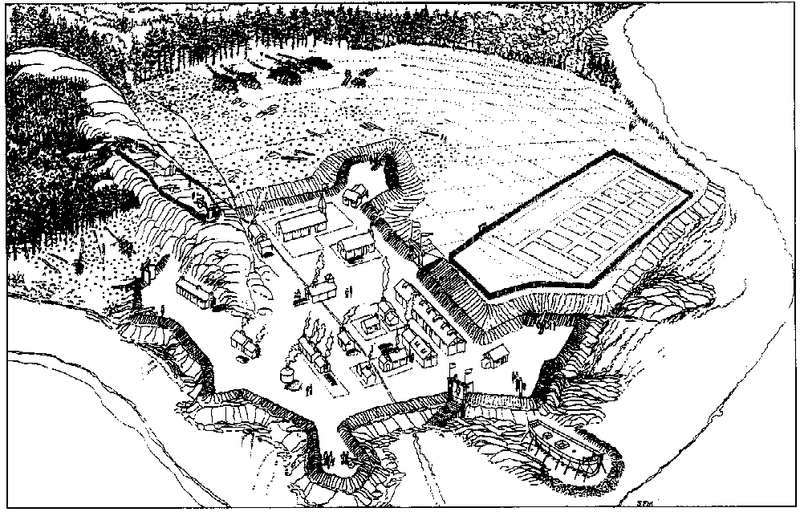 With no reason to suspect this, the colonists went ahead, made tense-but-peaceful contact with the local natives, and founded Fort St. George at the mouth of the Kennebec River; it was finished by mid-October. They then sent the Mary and John back to England with news of their success and for more supplies. While it was gone winter set in. Accounts are that it was quite bad, and half the colonists took the remaining Gift of God back home rather than try to wait it out, but it’s worth noting that as far as anyone can tell only one colonist died—quite the contrast with Jamestown, where 70% of the population died during “The Starving Time“. Unfortunately, that one was George Popham himself on February 5th, 1608. He was somewhere between 55 and 60 in 1608, so it’s not too surprising that he wasn’t able to stand up to the stress, but his death was the first in a series of blows to the colony. The colonists selected another of their number, Raleigh Gilbert, as their new leader. Both parts of his name are worth noting, as he was the second son of explorer Sir Humphrey Gilbert (of the famous last words from the deck of his foundering ship, “We are as near to Heaven by sea as by land!”) and his half-uncle was Sir Walter Raleigh. Raleigh was, of course, the man who founded Roanoke in Virginia; the early English colonization of the Americas was an incestuous affair. Fort St. George made it through to the spring before Mary and John returned. When it did, there was news: their patron, George’s father, had died just ten days after they had cleared The Lizard on their outbound journey the previous summer. Their influence at home was crumbling. The ship sailed home again, and returned again with more supplies and more news. As the second son, Raleigh Gilbert hadn’t inherited much from his father. Now he found out that his elder brother John had died childless and he’d become the heir to Compton Castle in Devon. He decided to leave Maine and return home. Disheartened at losing two leaders in quick succession, and staring down a second winter in Maine without enough support on the other side of the Atlantic, the other colonists decided to leave with him. But before embarking they came up with a load of sassafras harvested from trees in the area, as they had done in the spring for the first trip of the Mary and John. The leaves were worth something as they were boiled down for use as a topical painkiller at the time (and also make excellent filé powder), but couldn’t hold a candle to the money that tobacco brought, or hope to cover the costs of the Popham Colony. So in the end, despite the relative success of the Plymouth Company as compared to the London Company, the winner of King James’ competition was the one that had the will to hang on until they came up with a way to make serious money. More than a decade later Sir Fernando Gorges regrouped, reclaimed his moribund charter rights, and helped to finance the Mayflower expedition. With its success, he was able to establish a permanent grip on Maine, getting sole land patent to it in 1629. The modern-day state of Maine sprung from this recapitulation of the Popham Colony. The Popham Colony itself disappeared so thoroughly from history that it took until the latter part of the 19th century for New England’s historians to even be sure that it had existed. 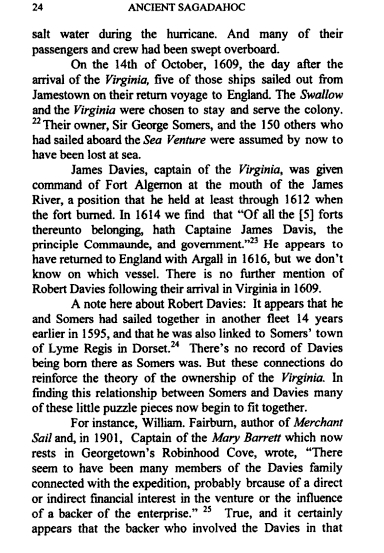 The sole evidence was a second-hand account in a book entitled Historie of Travaile into Virginia Britannia, which was written by Jamestown settler William Strachey in the 1610s but published in 1625; it remained notable not only as one of the prime sources of Jamestown history but also because it contained an eyewitness account of the wreck of the Sea Venture which is believed by Shakespeare historians to be the source material of The Tempest. The Popham Colony portion of it was more controversial, though, and by the mid-19th century the whole thing had degenerated into a heated war of New England town-boosterism disguised as an academic argument about whether the northern portion of King James’ 1607 Virginia charter had been acted on at all, or if Strachey was just relaying a tall tale. 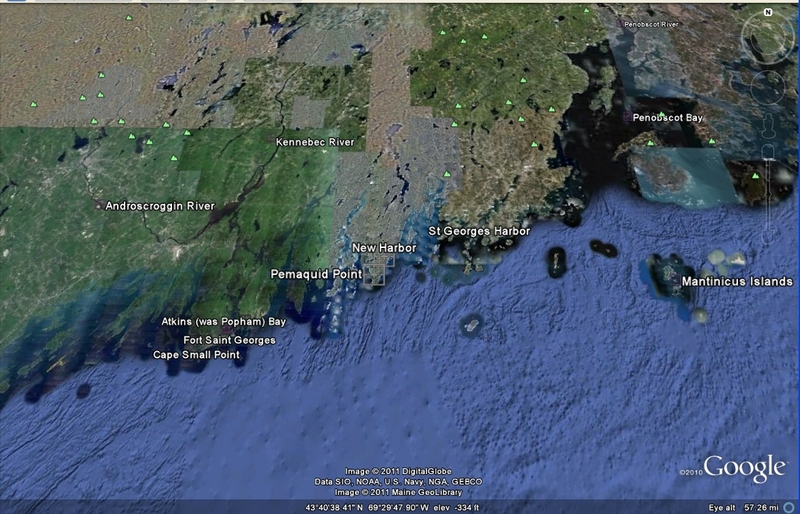 Enter a document entitled Relation of a Voyage to Sagadahoc. The Relation was apparently among Sir Fernando’s papers when he died in 1647, and fell into the keeping of one William Griffith (about whom nothing else is known) before eventually ending up in the library of Lambeth Palace, where it was found in 1875. It was immediately clear that this was the source of Strachey’s story, and that it matched up. His Historie even had something to add, as the Relation was missing its final few pages describing Gilbert and the remaining colonists’ decision to abandon Maine but Strachey’s retelling continued on to the end. By the 1890s there was a pretty good idea where Fort St. George was based on both the description of it in the Relation and the sketch map shown at the top of this article: it had been found in the Spanish archives in 1888. Though obviously drawn by an Englishman, it had apparently been taken by a spy and given to the Spanish ambassador to England, Pedro de Zuniga, who was somewhat obsessed with keeping tabs on non-Catholic colonists ignoring the papal Tordesillas Line. 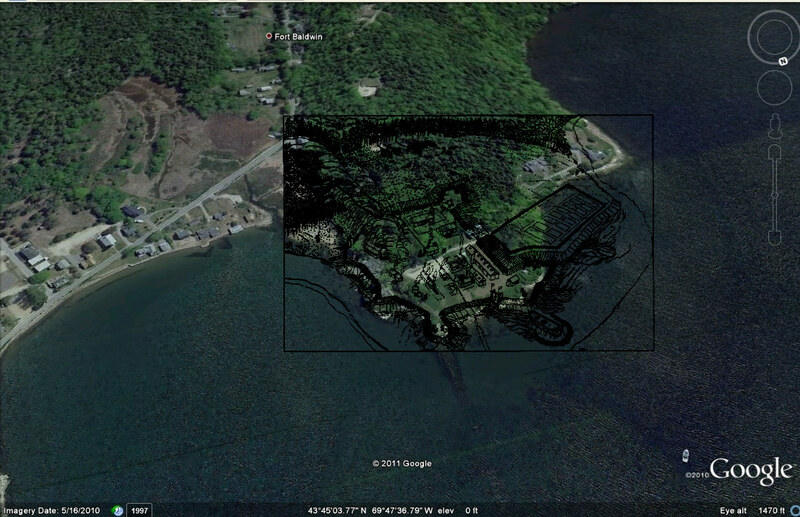 But it wasn’t until 1994 that archaeologists from the Peabody Essex Museum located Fort St. George’s physical remains in the shoreline backyard of a house in Phippsburg, Maine.